The continuous revaluation of the yuan has been bad for Zhu and her family because it has been shrinking their dollar assets. The family runs an auto part import business, and converted some of its assets into dollar account during the 1997-98 Asian financial crisis, when the yuan was considered unsafe. China depegged its currency from the greenback in July 2005, revaluing it by 2.1 percent. That triggered a process that has been eating into Zhu's assets ever since. Last year, the yuan rose almost 7 percent against the dollar, making the overall revaluation about 14 percent since July 2005. And Tuesday, the central parity rate of the yuan hit a new post-depegging high of 7.2454 against the dollar. "I am very upset and don't know how to handle my dollar assets," said 27-year-old Zhu. "Should I dump my dollars or just wait for it to rebounce?" Financial experts would suggest she sell it. 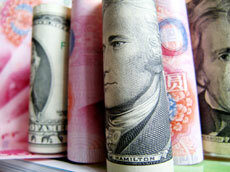 The market sentiment, too, indicates the yuan may rise another 8-10 percent against the dollar by the end of this year. Salaried people paid in dollars have not been spared either. "I'm paid in dollars every month. I remit the money back to China after converting it into yuan," said a Ministry of Foreign Affairs staff based abroad. Some domestic companies with overseas projects are aware of the loss their staff are suffering, though, and have taken steps to compensate them. They have begun paying their overseas workers in dollars for a fixed term, after which they review the situation. Every coin has two sides, however. People traveling abroad spend much less now. Young people eager to study abroad would save money, too, for they have to pay less in yuan. Also, Chinese investors would feel happy because they have to spend less money on the same overseas projects. Some people back home stand to gain too because of the rising yuan. Car buyers, for example, can get an imported vehicle at a lower price. But a rising yuan is a nightmare for Chinese exporters, especially the smaller ones. Tens of thousands of small- and medium-sized exporters face closure because of the rising yuan and scrapped or reduced export tax rebates. "The yuan revaluation has had a great impact on our exports," said Wang Fu, general manager of Shenzhen Jiayinking Electronics, which exports hi-fi systems to Japan, Europe and Africa. "I know many domestic enterprises making and exporting goods have collapsed." "Rising labor and material costs, coupled with the rising yuan, has shrunk our profit," complained Wang, whose company employs about 200 people. Jiayinking tries to cut its operational costs and raise prices when it gets enough orders to make up for the falling profit. That, however, is risky business, says Wang, because clients can shift to other companies. In a developed economy, companies can resort to financial derivatives, such as currency swaps and foreign exchange futures, to hedge against potential foreign exchange losses. But they seem a remote possibility at home given China's young financial market and lack of awareness among domestic enterprises.